Get a stylish look right at home with this stylish set which consists of hair straightener and hair curler. The hair straightener has ceramic coated plates to give you silky, shiny and frizz free hair with smooth gliding without the fear of tugging or pulling. This set also includes hair curler to get instant, smooth and glamorous curl. Wrap your hair around the barrel, use the clamp to hold it and create natural curls without kinks. 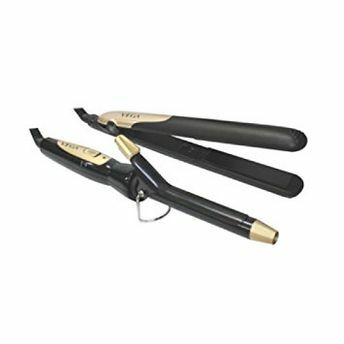 The ultra-light weight of straightener and curler make styling superfast and easy. On/Off switch with power LED indicator. Easy lock system, 360? Swivel cord.